The Techpacker Pro-Series brings you high-value fashion content from top industry experts to make the best out of your business with cutting edge information about fashion production, retail and technology. Imagine one day one of your biggest distributors tells you that customers have been returning your bestselling items at an alarming rate. These customers are reporting that the zippers of the jackets are breaking or that buttons are coming off after just a single use. That could be a sign your factory might have switched the materials without your approval. This development really catches you off guard. You’ve built a great relationship with your suppliers over the years. And you thought everything had been running smoothly. Apart from an initial adjustment phase at the beginning, product quality had always been consistent. Now you’ve got to worry about a potential return from every garment from that shipment! What happened? Customers aren’t likely to notice a small decline in quality from one shipment to the next, but when comparing garments over a longer period of time it can make the drop in quality evident. When you’re manufacturing abroad, it’s easy to turn your attention away from suppliers and settle into complacency. But the eventual consequence is often product returns because of what's known as quality fade. From critical issues to small and innocuous ones, quality fade can lead to problems in any importer’s supply chain. But, What is Quality Fade? Quality fade is a gradual decline in product quality over time. In most cases, for any given product, customers aren’t likely to notice a small decline in quality from one shipment to the next. But when comparing units over a longer stretch of time, like from one year to the next, the drop in quality is more obvious. Many experienced importers have their own horror stories about frustrating instances of quality fade. Maybe you’re a long-time dress shoe importer who starts receiving more and more reports of your shoes creasing or showing other signs of wear after minimal use. Or maybe you import jewelry and find the purity of silver in your charm bracelets has diminished over time. deliberately uses a lower quality material or component than initially agreed upon. The overall product might look generally the same, but suddenly you start noticing issues with a particular aspect of the product. Why Does Quality Fade Happen? As in any business, suppliers are always looking for ways to grow margins. As many suppliers would rather cut internal costs than raise their prices and risk losing customers, using lower-cost materials in production is common to economize. Unsurprisingly, trading premium components for cheaper ones often come with an equal tradeoff in quality. Why would a supplier risk losing your business by compromising quality without telling you? Usually, the supplier assumes they’re under less scrutiny from customers they have a longstanding relationship with. That’s why you’re more likely to experience quality fade with supplier’s you’ve worked with for longer. In most cases, quality fade only starts after the supplier has already successfully shipped multiple orders of acceptable quality products to you. And during a quality fade, the supplier only makes subtle changes to parts of your product that often don’t obviously affect the product as a whole. Without remaining vigilant, it’s easy for you to overlook these subtler changes happening over a length of time—at least for a while. But left unchecked, minor quality issues can certainly accumulate and lower the overall quality of your final products in a noticeable way. Quality fade can seem like an ironic cruel twist of fate. Setting quality standards for your products can be hard enough when first vetting suppliers (related: Preventing Product Defects Starts with Negotiating with Suppliers. Now you have to worry about the suppliers you’ve already vetted too? Providing an objective standard for QC staff to check your product during inspection. The key to using a QC checklist effectively is to finalize it prior to placing the initial order with a supplier and update it regularly. 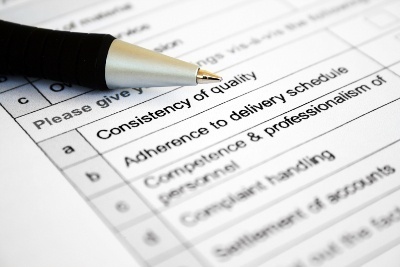 When used effectively, a QC checklist discourages suppliers from cutting corners and holds them responsible to the standard they’ve agreed to. If you think you’re experiencing quality fade, first check that your QC checklist is updated with any recent feedback you’ve given the inspectors and factory. This information can easily get lost from person to person over time. Suppliers are much less likely to cut corners regarding quality if you set an expectation for outside inspections in advance. Most suppliers are juggling a number of overseas orders at the same time from importers with varying attention to quality control. If a supplier’s balancing act involves one importer that doesn’t anticipate inspection and one that does, which importer would you rather be? One importer’s loss may be your gain. Establish an approved sample to serve as a model for quality comparison to help inspectors identify any discrepancies between your expected product and what the factory has actually produced. Ask inspectors to verify any Component Data Form (CDF) for your product to check whether the factory has used the right components in construction and assembly. Check raw materials with incoming quality control. If you’ve had issues with raw materials in shipments before, you might want to consider incoming quality control (IQC). During incoming quality control, inspectors check raw materials prior to mass production through pre-production inspection, lab testing or verifying a CDF. Since factories usually buy raw material in bulk, any quality issues related to these will likely affect most or all of an order. Ensuring quality matches your specifications prior to production can save you a lot of money and time, as it can be difficult to address any issues inherent in parts or materials once production has started. Specifying details on the initial tech pack can be a great way of preventing quality issues and ensuring long-term success . Lab testing is sometimes the only definite way to verify the composition, safety and performance of materials and parts used in your product. This is especially important if you manufacture or import children’s clothing for example, where safety can particularly be an issue. Regulations governing your product type in the target market. Your product’s intended use and attributes. Any claims made in marketing your product (e.g. water or stain resistance in fabrics). Many factories don’t have the proper equipment or trained personnel on-site to conduct professional-grade lab testing. If your factory claims to have a testing lab, make sure you send someone to verify the factory’s capabilities first. Many importers choose to coordinate with a certified third-party lab to conduct testing. Depending on your products, you might also regularly check the performance and safety of the product. You might not need lab testing for every single order if you’re simply checking in on your supplier. Simply testing your product on an annual basis may be enough to deter your supplier from substituting parts or materials with cheaper alternatives. Lastly, what holds everything together to catch potential quality fade is accountability. It’s vital to establish accountability for quality issues to encourage factories to meet your standards, as well as protect your business if issues arise. Many importers use incentive schemes to encourage factories to meet their standards. This sometimes means including financial penalties for unacceptable issues in written agreements. Many importers choose to make their supplier accountable for re-inspection costs if an order fails to pass initial inspection. Typically, these consequences and accountability expectations can be set in your purchase order or a vendor agreement in the terms and conditions section. Chargebacks can be difficult to enforce if you’re only importing a small quantity of inexpensive products or working with a supplier for the first time. The good news is that if you’re experiencing quality fade with a supplier, you’ve likely already built up a longer term business relationship. You can use your previous buying history and influence to try negotiating with your supplier. No importer is safe from quality issues in their product, nor disagreements with their supplier. No matter how long you’ve been importing, you should always provide clear and objective specifications for your product and continually compare your supplier’s production to that standard. Always remember that you usually receive the product quality you pay for. It’s very difficult to get high product quality at a dirt-cheap price. So it could be worthwhile to pay a slightly higher price if it will safeguard your relationship with a supplier and dissuade them from taking quality shortcuts. The author of this post is Client Manager of InTouch Manufacturing Services, a Western-owned, third-party QC firm headquartered in Shenzhen, China. InTouch helps importers improve their product quality and manufacturing experience by offering product inspections, factory audits, lab testing and product sourcing in China, India, Vietnam and elsewhere throughout Asia. To receive fresh industry news and original content in your inbox every week, sign up for the Techpacker newsletter to be the first in the know! Copyright © 2017 Techpacker All rights reserved.